Former 60 kW pilot plant. Abstract / Summary: The company Rosch Innovations / Save The Planet AG has developed so-called kinetic power plants. These self-running and zero emission power plants generate permanently usable electric energy without any fuels, wind power or solar energy. The author of this report and website assumes that this novel energy technology extracts usable energy from an hitherto untapped and everywhere available energy form and source which is called space energy, vacuum energy, or ether energy. Rosch and their distribution partners, e.g. the German company E-Cat Deutschland GmbH and its Austrian partner company Sekra GmbH , offer industrial size power plants with an electric output power of 200 kW - 100 MW. An industrial size power plant at a publicly known and visitable customer site does not yet exist. Potential industrial customers or potential licensees may request a visit at a Rosch site in Thailand where a 100 kW pilot plant can be demonstrated and inspected. A former 60 kW pilot plant which was several years available at a Rosch site in Germany - see picture on the left - is meanwhile relocated to an undisclosed location. 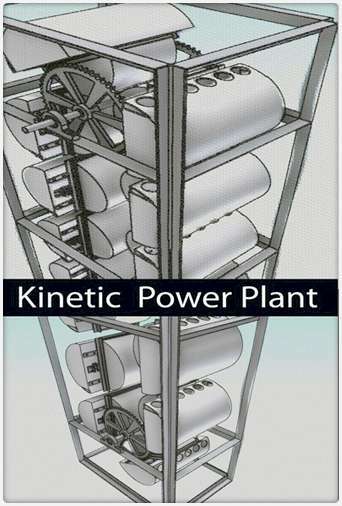 It is intended that licensees of the Rosch technology implement the production of the kinetic power plants. 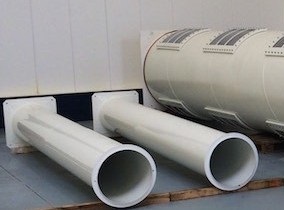 In Germany there are several potential customers who would order an industrial size kinetic power plant but this is not yet possible because of still ongoing negotiations between Rosch and a potential licensee. A pilot plant was developed and is located at the research and development (R&D) laboratory of Rosch in Belgrade in Serbia. Several scientists who are working at the Rosch R&D lab have previously worked in military research projects. The pilot plant at the Rosch R&D lab requires an electric input power of 1,6 kW and generates an electric output power of 11,8 kW. 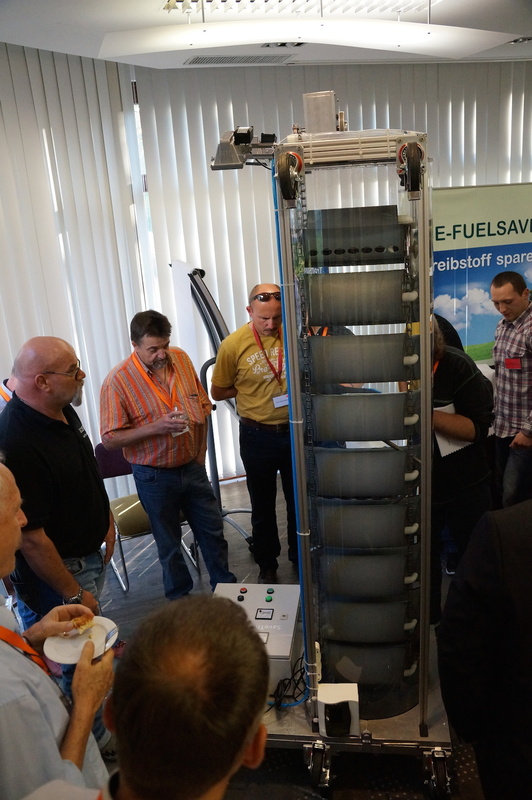 A self-running demonstration model with approximate dimensions 60 × 60 × 230 cm was presented at a congress about entirely novel energy technologies in Bregenz in Austria on 18 October 2014. The casing for the water column and the chain drive is made of acrylic glass. After a short initial supply of electric power from a battery the demonstration model started its self-running operation. The electric generator produced electricity not only for electrical loads but also for the electrically-operated system components such as the compressor and control unit. The demonstration model did generate an electric power of a few hundred watts for about two hours. The author of this report and website has viewed the self-running demonstration model at the congress in Bregenz. After about two hours operation the demonstration model was switched off and prepared for removal. 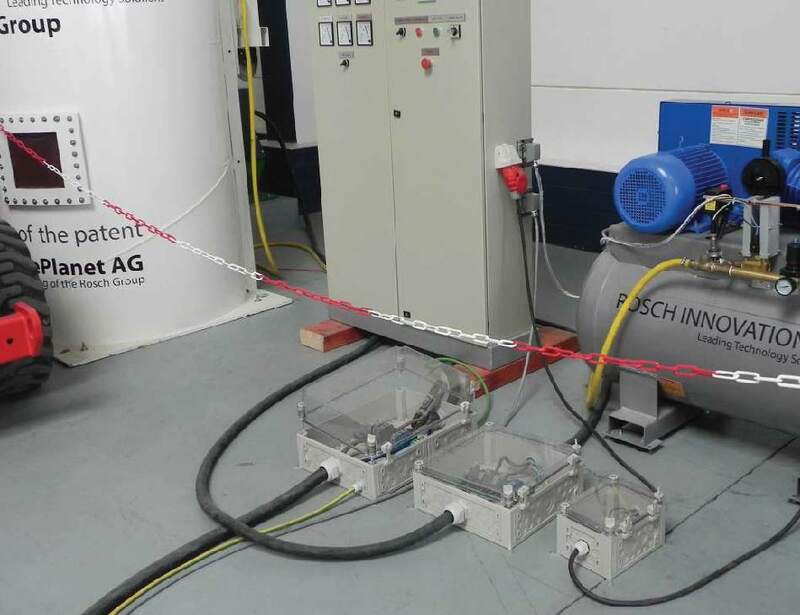 In April and May 2015 Rosch and the Austrian Association GAIA have presented a self-runniing and zero emission 5 kW pilot plant at a Rosch site nearby Cologne in Germany. Public viewing dates were available in the period from 25 April 2015 to 6 May 2015, Another public viewing event took place on 13 May 2015. On that day the 5 kW pilot plant was switched off and disassembled. A video from the disassembling is available in Ref. [6a]. The author of this report and website has attended two events at the Rosch site nearby Cologne in Germany, namely on 1 and 13 May 2015. During these both visits the author of this report and website has seen that the Rosch site nearby Cologne in Germany comprises a reception, offices and large halls for the manufacture of prototypes and demonstration models. The 5 kW pilot plant consisted of a steel tube, an electrically operated compressor, an electrical generator and a control unit. The steel tube contained the chain drive, fillable containers which were attached at the chain drive, a valve system which can fill the containers with air, and water. The height and diameter of the steel tube was about 4,3 m and about 45 cm, respectively. Located at the top of the steel tube was the compressor, a gear and the generator which generated three-phase electric power with a voltage of about 400 V. The weight of the complete system without water was about 300 kg. The steel tube was fixed at the ground and laterally at the wall. This fixation prevents an overturning of the heavy steel tube in case of a malfunction of the chain drive. 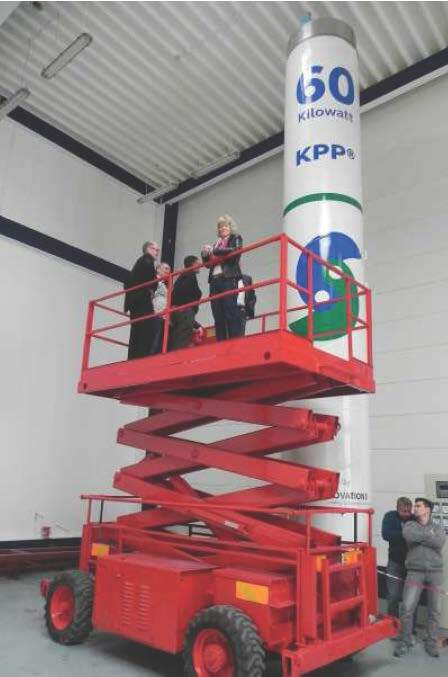 The total height of the overall system was about 5 m including space for a lifting device for maintenance. The generator produced electricity also for the compressor and the control unit and the usable electric output power was 4,8 kW. Several powerful lamps and infrared heaters served as electrical loads with a total power of 4,8 kW. 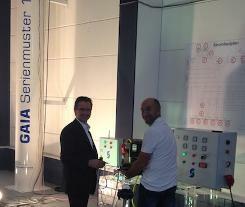 It was intended by GAIA and Rosch to make the 5 kW power plant commercially available. However, their collaboration did not work well and finally Rosch and GAIA have abandoned their cooperation. Rosch and their distribution partners, e.g. the German company E-Cat Deutschland GmbH and its Austrian partner company Sekra GmbH , offer industrial size power plants with an electric output power of 200 kW - 100 MW. 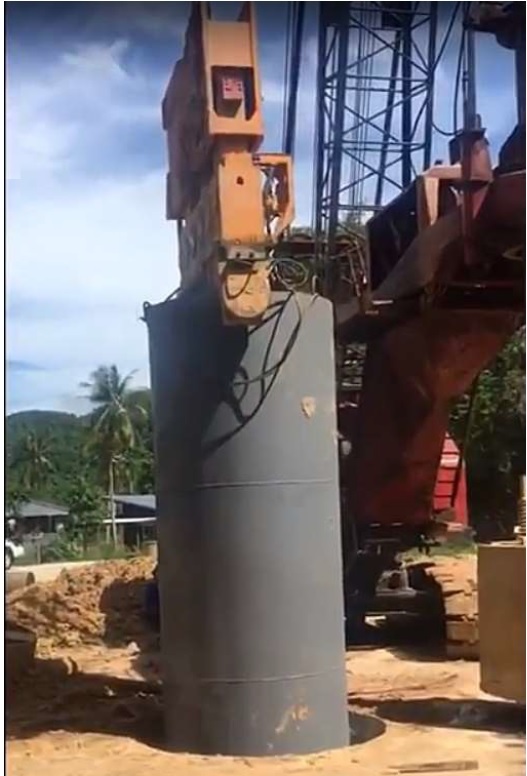 Potential industrial customers may request a visit at a Rosch site in Thailand. There a self-running and zero emission 100 kW pilot plant can be demonstrated and inspected. Three pictures of a former 60 kW pilot plant are presented on the left [7g]. The diameter of the steel tube is 1,3 m. This former 60 kW pilot plant was several years available at a Rosch site in Germany. Meanwhile, however, it is relocated to an undisclosed location. It should be mentioned that Rosch or one of its distribution partner will request from a potential industrial customer a proof of funds before arranging a visit at the Rosch site in Thailand That is just a measure to ensure that a potential customer is seriously interested in a power plant. Another reasons why it takes so long to make entirely novel and environmentally friendly energy technologies tangible are presented in a correspondingly labeled section in Ref. .
On the one hand it is important to ask critical questions. On the other hand it is also vital to appreciate the work of the Rosch and GAIA staff members and what they have achieved, assuming that the Rosch power plants are genuine. The author of this report and website does not agree with several statements and decisions of Rosch and GAIA. Nevertheless, the author of this report and website still assumes that the Rosch power plants are genuine. If the Rosch kinetic power plants were just a fake, why then all the effort to have staff members, buildings, offices, several sites, large halls, facilities, devices etc. ? Just to collect money in order to abscond abroad subsequently ? That appears rather unlikely. Moreover, some self-running pilot plants were inspected by various potential industrial customers or licensees. Their engineer teams did not detect indications for a hidden external power supply. The operation principle of the kinetic power plants from Rosch is still a company secret. The view of the author of this report and website about the operation principle is the following. Assuming that the power plants from Rosch are genuine, then they represent one type of many different self-running and zero emission systems which generate usable energy. Such systems do not need any feed or fuel from the outside but extract usable energy from an everywhere present form of energy which is called space energy, space-time energy, vacuum energy, or ether energy as described in Ref. . Likewise there are many different types and constructions of conventional energy technologies which generate usable energy by converting a feed or fuel into another form of energy. The power plants from Rosch utilize the gravitational field of the earth and magnetic and electric fields in the electromagnetic generator. In established physics or mainstream science the gravitational, electric and magnetic fields are termed as so-called conservative force fields. This means that a motion in a closed loop does not lead to a gain of energy. Meanwhile, however, we can start from the premise that there are various devices which allow a self-running motion where a movement in a closed loop does result in a gain of energy [8,9]. Such devices are so far not considered within the framework of established physics or mainstream science because it is assumed that they are impossible. Devising a self-running construction or process requires a thinking out of the box. It comprises a consideration of existing forces and their appropriate consolidation. A self-running system comprises a construction where the total effective force is locally and periodically smaller or larger than that of a standard type design. Overall that corresponds to a system which comprises non-conservative force fields. Ref. provides an example of a self-running device whose operation principle is described in publicly accessible documents. Its operation principle appears fairly comprehensible. Once it is understood one has an idea how a self-running system can work concretely, at least at the macroscopic scale. Devising a self-running system by considering the existing macroscopic forces does not require to know the source of the generated energy. Nevertheless, it is of course an interesting question from where the generated energy comes from. It is assumed that self-running devices imply at the subatomic level an extraction of usable energy from an everywhere present form of energy which is called space energy, space-time energy, vacuum energy, or ether energy as described in Ref. . The tapping of this form of energy occurs via the earth`s gravitational field and / or electromagnetic fields. Here the "via" is emphasized because this is not the same as an extraction of usable energy from the earth`s gravitational field and / or electromagnetic fields. It should be mentioned that the internal design of the electromagnetic generators of the power plants from Rosch deviates from a standard type design. German-language report about the German-language congress "Bahnbrechende Energietechnologien" about novel energy technologies and related topics in Königstein nearby Frankfurt in Germany on 29 and 30 September 2018, published on pages 10 - 23 in the November / December 2018 issue of the NET Journal (ISSN 1420-9292): http://www.borderlands.de/net_pdf/NET1118S10-23.pdf . 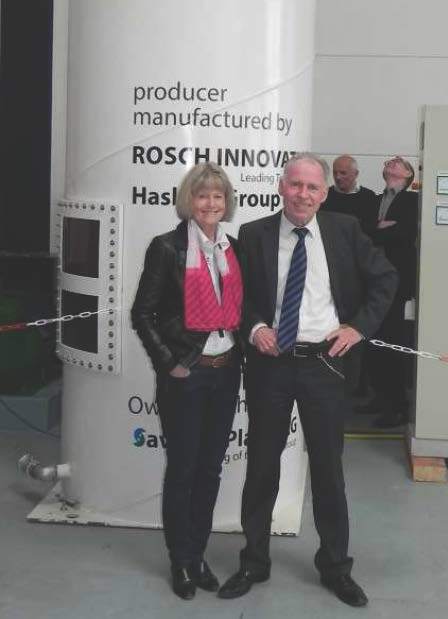 A report on Hartmut Dobler's talk about the kinetic power plants from the company Rosch Innovations is available on pages 18 and 19 (pdf pages 9 and 10). On page 18 there is a picture from the contruction works of an industrial size power plant in Thailand.